Light Up the Fox Celebration at Jones Park this Friday! 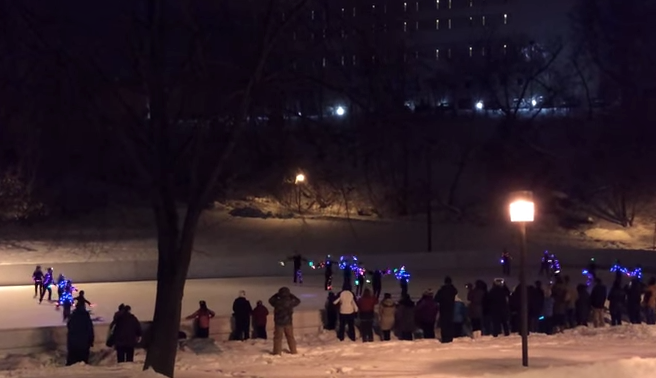 Posted on Feb 2, 2015 by Appleton Downtown Inc.
You are invited to join the Light Up the Fox Celebration at Jones Park in Appleton on Friday, Feb 6, at 6:30 pm. The 2nd annual Riverfront Light Display on Water St in Appleton which will stop shining nightly (5-10 pm) on Thomas Edison's birthday, Feb 11. Time remains to easily view-from-the-road, this free showcase of designs created by area students. Our talented design teams from area high schools and youth groups: Appleton East, Appleton West, Little Chute, and Boy Scouts of America. All are welcome. Warming Shelter will be open to purchase refreshments. Photo above is from last year's Illuminated Skate Routine. A picturesque scene that certainly elicits hometown pride. It is also attached if you experience a problem viewing in your browser.